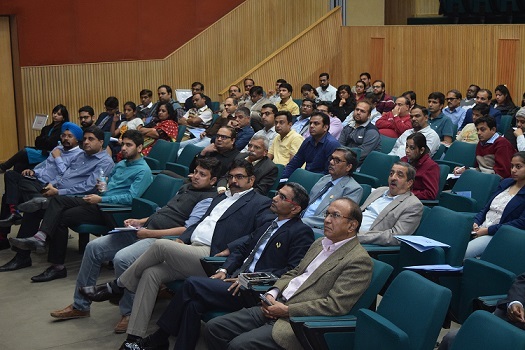 The Industry Interface Office (IIO) of IIM Indore conducted a Talk Series on the topic—‘Leadership in a Dynamic Environment’ on December 29, 2017. 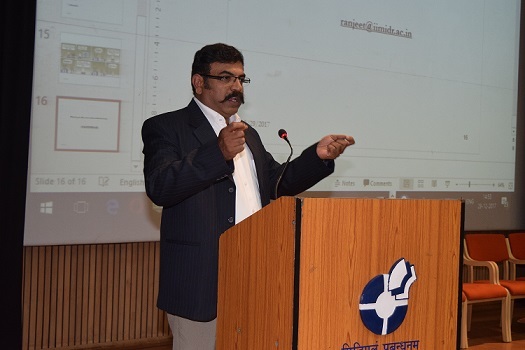 The talk witnessed a presence of five industry experts; namely, Professor Ranjeet Nambudiri, Faculty, IIM Indore; Capt. 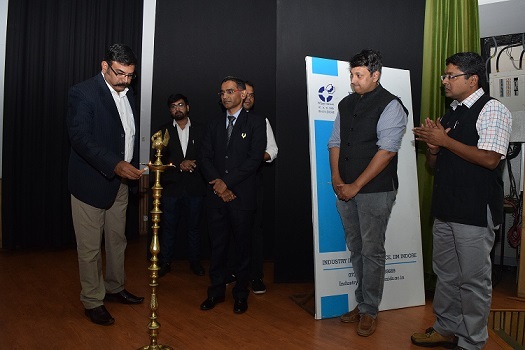 Vinod Nair, an ex-army commando and a leading corporate trainer on leadership; Mr. Aditya Bhat, Head, Jio Studios; Capt. Gajanan Karanjikar, Head, Coastal Shipping, Integrated Logistics Solutions; and Professor Dibyadyuti Roy, Faculty, IIM Indore. The series revolved around topics like—Leading an organization under ever-shifting goalposts of regulatory frameworks, Leading a marketing organization under changing consumer needs and Creating a dynamic/responsive organization through effective leadership. The session began with a lamp lighting ceremony by the guests. 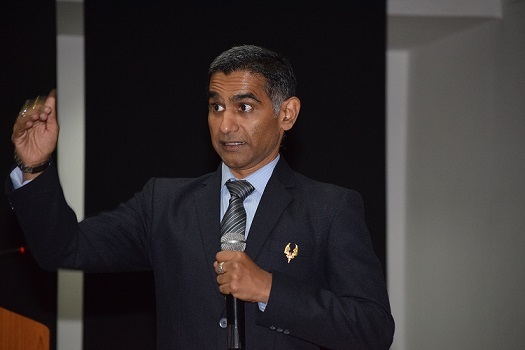 ​​The first talk was by Professor Ranjeet Nambudiri. His spoke about the current state of conceptualization of leadership and early theories of leaderships, right from 1800s-till date. He also discussed how these theories were appreciated or criticized for various reasons with examples. These included The Trait Theories, The Behavioral Theories, Contingency Theories, Situational Leader Theory, Transactional Theories, Transformational Theories, etc. He also gave examples of how leadership changed in all these years and how people orientation changed in terms of leadership. He then talked about how followers affect leadership as well. ‘The mature the followers, less the need of leadership’, he said quoting a theory. He concluded by discussing emotional intelligence; and quoted self-awareness, self-regulation, motivation, empathy and social skills as its dimensions. The second talk was Capt. Gajanan Karanjikar. He began his talk mentioning that he learnt all the leadership skills on the ground, without any second thoughts of thinking whether a particular action is right or not, as he was just following his leaders, i.e. learning from someone else’s mistakes. ‘There’s a difference between doing something on your own and getting it done by someone; but to be an effective and good manager you need to be a good person at heart’, he said. His talk also revolved around logistic and supply chain management and how the sector would change in the coming years. ‘Fifty years ago, no one imagined there would be a scarcity of air and water. But today we have to face this. Ten years from now there would be a need to decarbonize air and that would change the industry logistics’, he said. Discussing about technology, he said that leadership would be disrupted, as everything would be controlled by technology a few years from now. But there’s a lot to lead, than to be led, he concluded. The third talk of the series was by Capt. Vinod Nair. He shared an incidence from 1990 at LOC and mentioned how being labelled for doing something or being offered to do something again and again can be a hurdle in our development. ‘Each one of us is a powerful combination of our abilities, education, upbringing, etc. Leadership is complicated, challenging, demanding and yet a wonderful thing we can experience in our lives’, he said. He concluded that things keep changing in lives and accordingly the leadership also keeps on changing. The fourth talk was by Mr. Aditya Bhat. He talked about opportunity and situational leadership. ‘We should not see a leader in a single person, but try and imbibe the qualities of different people around as well’, he said. He also discussed about his work experience while in Jio—how he planned the Jio Dan Dana Dan Campaign and Swachh Bharat Campaign. This was followed by a panel discussion. 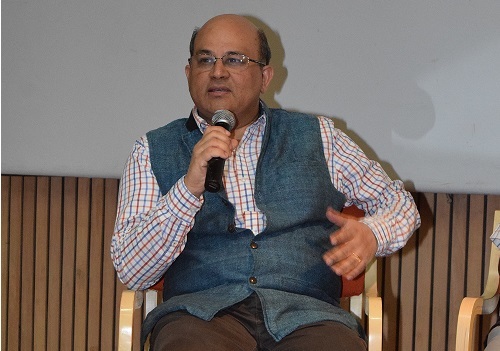 The panelists included all the guests, with Professor Dibyadyuti Roy as the moderator. The panelists while discussing various aspects of leadership, agreed that empathy is quite relevant for an effective leadership. The panel also discussed about how the funding patterns across the companies have changed with time. The panelists shared their views on whether leadership is all about doing the right things or doing the things right. 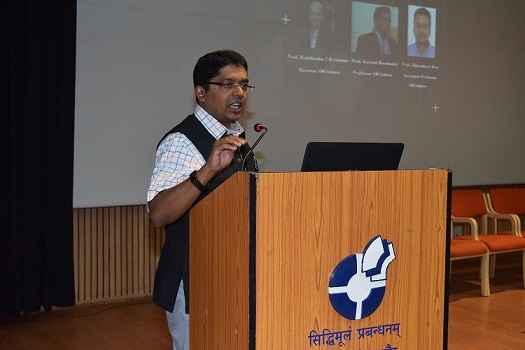 Professor Rishikesha T. Krishnan, Director, IIM Indore also addressed the audience and mentioned about various roles innovation plays in leadership. 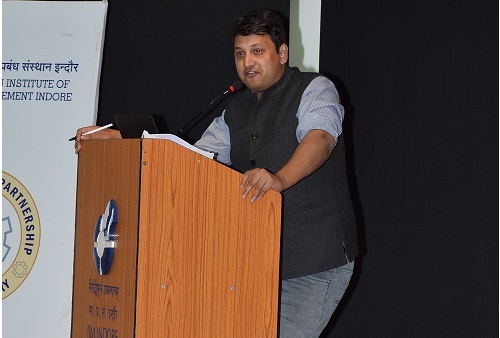 He also discussed about path breaking vision in leadership in today’s scenario. 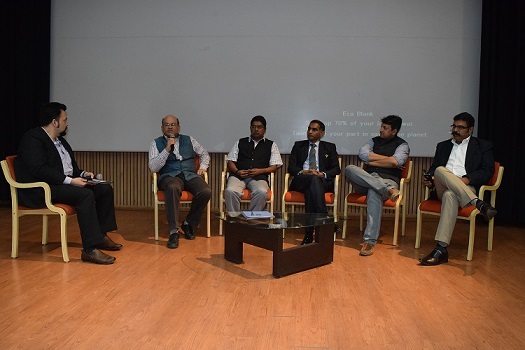 The talk series attended by various industrialists from Indore, Pithampur and Rau region along with students from the Institute; was appreciated by the delegates. The session concluded with high tea.